Clearly money was no object on the People Magazine "set" for Tori Spelling and her husband to reennact famous couples from yesteryear. Tossing on some vintage clothes and dropping a green screen in the background is all you need. Tori and Dean dressed up, from what I hear, for a music video they were shooting for their reality show because, you know, you need a music video. Tori, time to hang up the reality show and put all of your focus on bringing back Donna Martin, specifically the scene where Ray tossed you down the flight of stairs. I'll be waiting. Tori played the role of Cher with her rack-attack hanging out and Dean did his best Sony. Apprently Sony used to snap his fingers a lot? Great acting, Dean. Next up Tori played Courtney Love and Dean played Kurt Cobain. Nice job holding the guitar. Very believable. 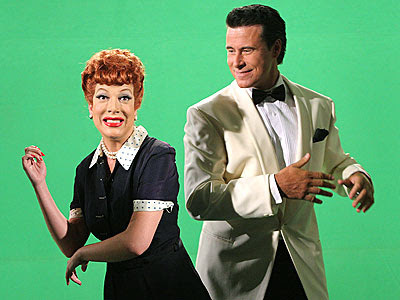 Finally, Tori played the role of Lucille Ball, in which apparently Lucy used to pose like that. On the other side, Dean played the role of.....Phil Hartman? Seriously, what is the reasoning behind this? And how much are they getting paid for this. Yes, I'm jealous. I would dress up as the entire cast of 90210 and The Hills for $19.99 and chicken soft taco. In the third pic, I believe Dean is supposed to be Wayne Newton. It's an incredible likeness! Your Favorite Blogger Hard at Work! Click on My Delightful Photo to Email Me!